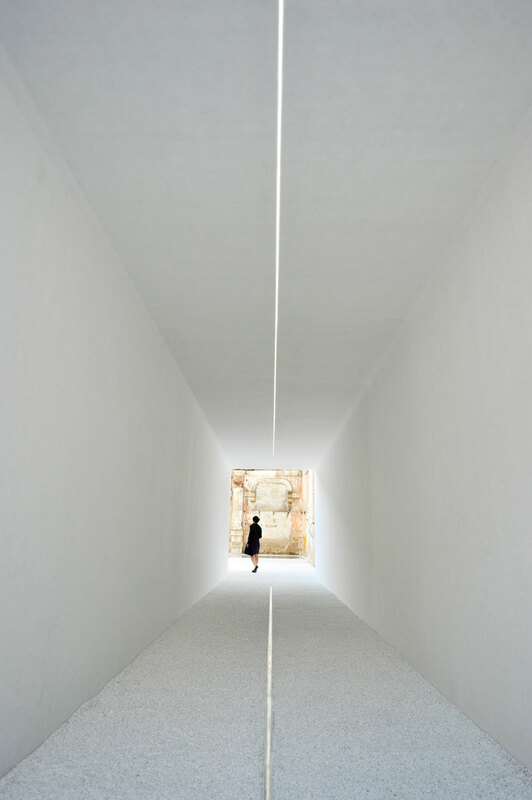 Izumi Okayasu – Lighting designer, Izumi Okayasu Lighting Design // Masafumi Shinoda – Technical Adviser, Tamon Co.,Inc. Toshiba >>> Leading Innovation! 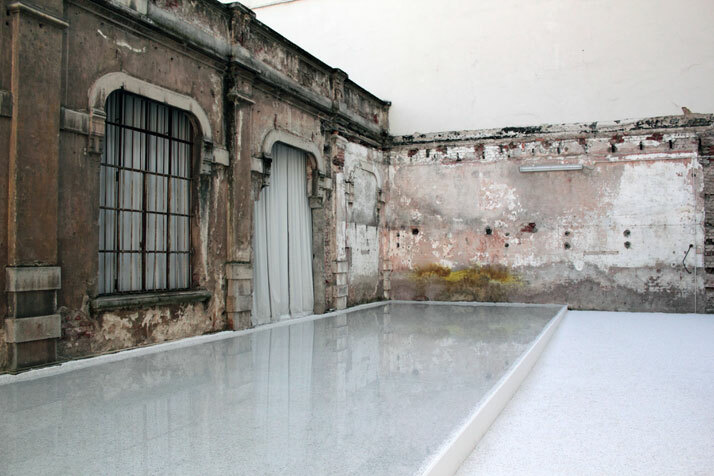 That’s how we best know this brand; this year they surprise us as Toshiba explores the theme of ‘Luce Tempo Luogo’ in a lighting installation at the Cortile di Via Savona at Zona Tortona. Toshiba also participated for the first time in Euroluce in the main FIERA district, where it showcased its full portfolio of LED lighting, including its latest Light engine, proving once more its brand motto right for its leading innovation. However, we at Yatzer were mind-blown with ‘Luce Tempo Luogo’, a themed exhibition which was the result of the teaming up of DORELL.GHOTMEH.TANE / DGT ARCHITECTS and Mr. Izumi Okayasu with Toshiba. 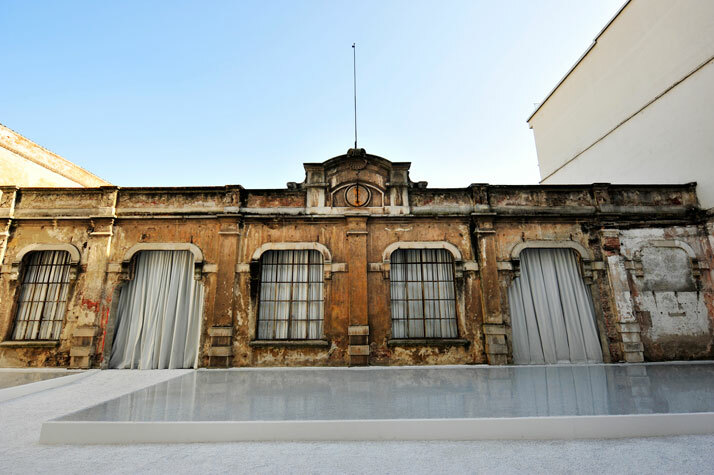 Conveniently located at Zona Tortona, Cortile di Via Savona is a unique building built over a century ago, although only the walls remain today the building has witnessed major events in the country’s history. The building was studied carefully, so that greater value through creativity could be applied to the exhibition in this unique space. 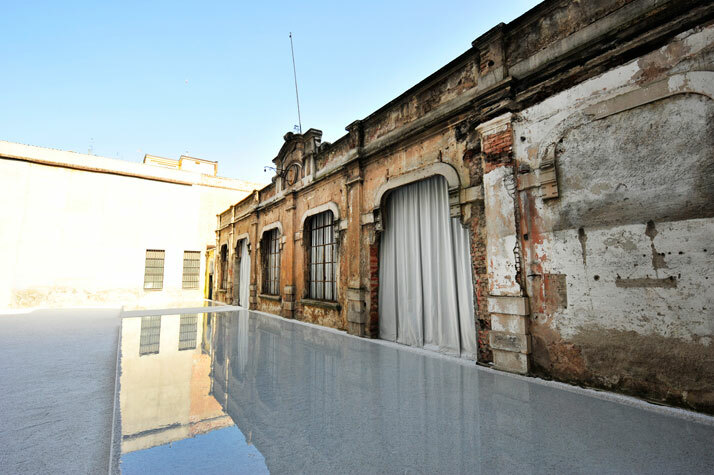 The exhibition installation undulates in three separate spaces; the entrance, the courtyard and the main interior space. 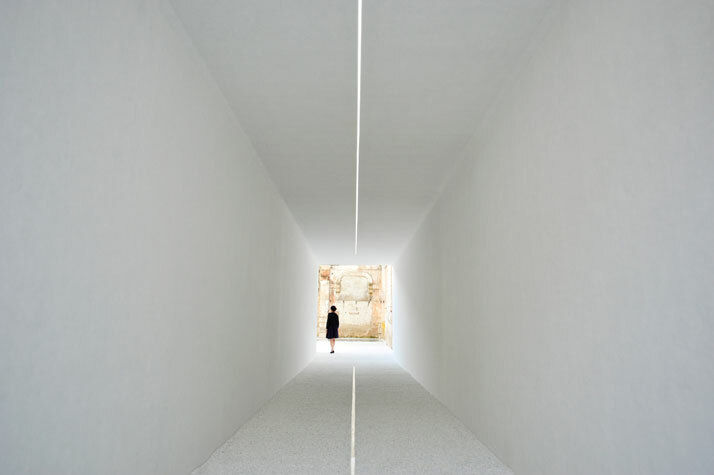 Upon entrance, a pure white tunnel contrasting to the structural ruins of this historic building is the ‘access’ to the installation, a single light line stretching along the ceiling is reflected onto the stream of water on the floor yet to become another line of light. 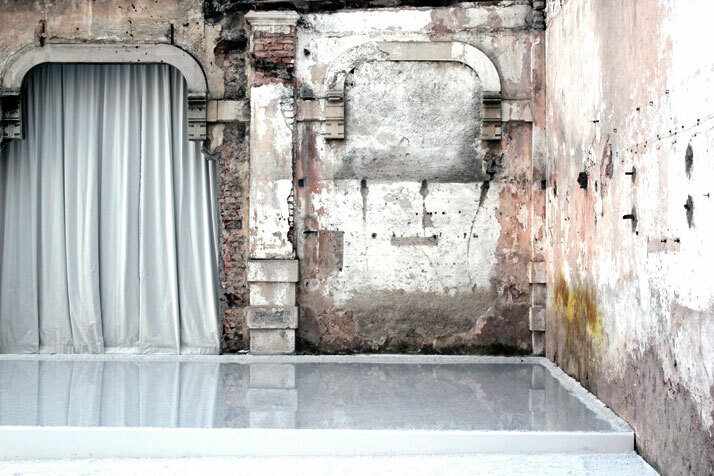 Continuing our journey to second space, the courtyard, where constant ripples created on the water’s surface are illuminated by the sun during the day and by LED’s at night, and these ripples are then reflected on a single wall that survived over the century that passed. The shimmering, swaying body of water imbues the remaining wall with moments of light. 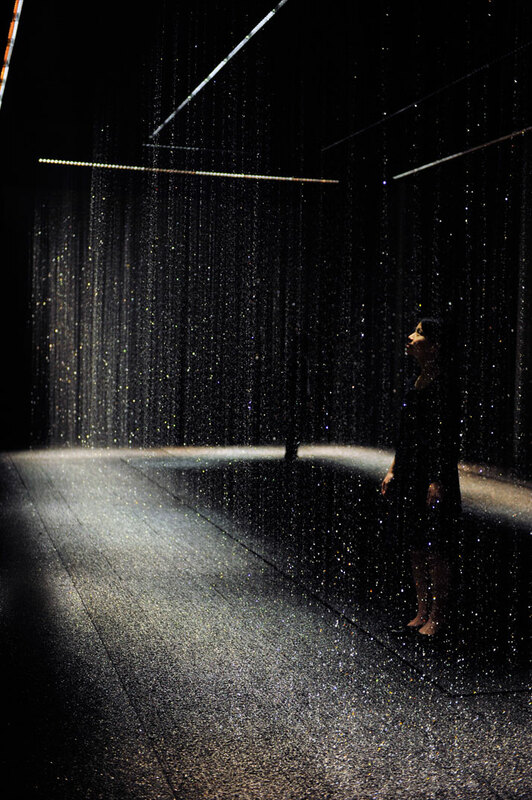 Continuing into the main interior space is a darkened room creating magnificent and imposing feelings as innumerable pulses of LED lights engage in recreation through curtains of water, creating feelings, moods and effects hard to describe as they only exist at that time and in that place! 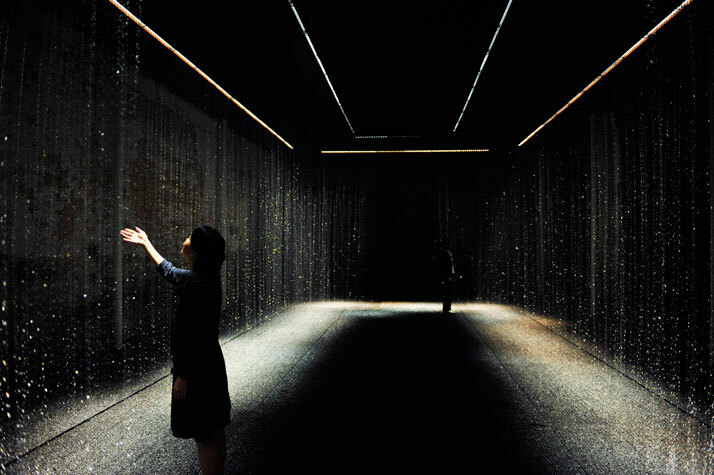 An almost fantastical space, where multiple layers of water curtains are constantly transformed as the result of the effect of countless LED bulbs. The installation explores the possibilities of LED in conveying emotional resonance. Realized through the collaboration of an international team and harnessing multiple concepts, the installation explores and demonstrates how new technologies create new value. Furthermore, Toshiba is also participating at Euroluce, Milan Salone’s dedicated lighting exhibition, showcasing its new LED light engine, which embodies the new GH76p cap developed with BJB, a leading manufacturer for lighting fittings in Germany. Designed to achieve 1600 lumens and 1100 lumens output in a 90mm by 42mm slim compact body, to support dimming, and available in three color temperatures, this bright, easy-to-load, universal LED expands the creativity of designers and architects to wider applications, including ceilings, down lights and garden lights. Toshiba also showcased the design of a candle type LED lamp chandelier, and its wide line-up of LED lighting. Today, lighting is much more than a means to light up rooms and public spaces, and LED lighting can do much more than contribute to saving energy. Light has an emotional power that creates atmosphere and enriches life. Toshiba celebrates this quality as akari, a Japanese concept that conveys the ability of lighting to appeal deeply to our senses and emotions. Toshiba, brings new technologies and innovative design to Milan’s fairgrounds at the Salone, after all, that’s what Salone is all about!